• The AT&T-Time Warner approval has opened the door for 21st Century Fox's sale to either Disney or Comcast. • Murdoch is now likely to receive a $60 billion-plus, all-cash offer from Comcast's Brian Roberts for the bulk of 21st Century Fox assets, sources familiar tell us. • An offer of that size would be at least a 15% mark-up from Disney's $52.4 billion offer, and could force Disney's Bob Iger to offer even more. • Fox has rights to the 2026 World Cup, which was today awarded to the United States, Canada and Mexico and is therefore expected to bring in record revenues, according to the host nations' projections. • Due to FIFA's planning mistakes -- they were forced to award Fox first dibs on rights after scheduling the 2022 World Cup in Qatar in the Fall -- Fox will pay just $480 million for the 2026 World Cup. Industry analysts believe the rights could have sold for as much $1 billion. • Fox shares are up 57% year-over-year and still climbing. The Big Picture: More than half a century after launching his newspaper empire in Australia and the UK, Murdoch has built 21st Century Fox into a global powerhouse, navigated it through tumultuous change in the media industry and is now poised to sell it above value to the highest bidder. Of all the media companies likely to be sold to bigger tech, media and telecom companies in the M&A surge ahead, Fox is among the most prized. 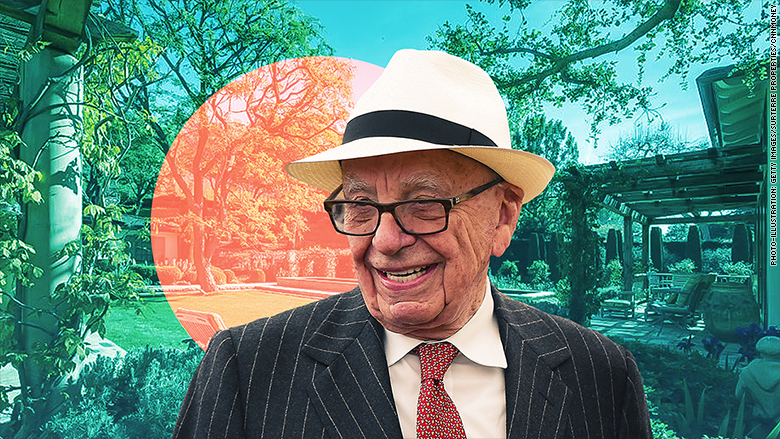 The Belle of Bel-Air: Most of Murdoch's dealings with suitors happen at Murdoch's Moraga Estate in Bel Air, sources with knowledge of the matter said. Disney's Bob Iger has met with him there multiple times. NYT's Ed Lee reports today that Roberts went there in November to broach the Comcast offer. Bonus: Can AT&T actually go head-to-head with big tech now that it has Time Warner? I try to answer that question here. Welcome to PACIFIC. Los Angeles, San Francisco and Seattle are all candidate host cities for the 2026 World Cup. The tournament is roughly 2,923 days away. By that point, you may be getting to the stadiums by autonomous flying taxi or subterranean tunnel. Or not. Twitter is building dedicated pages for news events that will curate the best tweets, video and commentary on a single story. • "We started with two simple questions for this effort: a) how do you find what is happening right now? and b) how do you get to the best of Twitter around an event - conversation, tweets, recaps, video - in one spot?" • "For example: The NBA Finals was amazing on Twitter ... But you have to work to find it across following the right accounts, search, moments, etc. ... With these changes, you should get a personalized notification when the game is on ... When you tap in, you get recaps, moments, latest tweets, videos." • "The goal is to make it easy to quickly find and follow the events and breaking news you care about on Twitter. Especially if you already don't have a well-curated timeline." The Big Picture: Twitter Product VP Keith Coleman tells BuzzFeed that the changes are part of a "much larger arc in the transformation of Twitter," adding that Twitter eventually wants these event pages to exist for anything that's happening in the world: "Every episode of every TV show, anything that's going on that's remotely newsworthy, every game of every sport — that's the dream we're heading towards." What's Next: The World Cup. Twitter will roll out the new product with a dedicated World Cup page and individual pages for every game, "including scores, Tweets, videos, and Moments." Bonus: Recode's Kurt Wagner reports that "Twitter stock, which has been a relative train wreck for most of the past few years, is suddenly at a three-year high... up 155% from a year ago." Why? It's profitable, it's growing and it's getting better. Kim Kardashian is lobbying Twitter CEO Jack Dorsey for an edit button on Twitter. "I had a very good convo with @jack this weekend at Kanye's bday and I think he really heard mem out on the edit button," she tweeted late Tuesday. Dorsey replied: "Now I see why I was invited." What's next: Twitter has hedged on adding the feature since there are pros and cons to it. But with the ever-influential Kardashian pushing for it, perhaps it could soon become a reality. Bloomberg TV has just published David Rubenstein's full-length interview with Apple CEO Tim Cook from Duke University on May 13. In addition to familiar remarks on privacy, Cook got personal on his decision to come out, his approach to running Apple and his political ambitions. • On Coming Out: "It became clear to me that are lots of kids out there not being treated well, including in their own families. Kids need someone to say 'Oh, they did OK in life and they're gay. So it must not be a life sentence.' It would tug on my heart even more and it got to the point where I'm making the wrong call by trying to do something that is comfortable for me which is to stay private and that I need to do something for the greater good. No regrets." • On Long Term Thinking: "We run Apple for the long term. It always struck me as bizarre is that there is a fixation on how many units are sold in a 90-day period, because we're making decisions that are multi-year. We try to be very clear that we don't run the company for people who want to make a quick buck. We run the company for the long-term." • On Running for President: "I'm not political. I love focusing on the policy stuff, but in the dysfunction in Washington between the legislative branch and so forth, I think I can make a bigger difference in the world by what I'm doing." The West Coast housing crisis, driven in large part by the surge of tech money in Seattle and Silicon Valley, is going to get worse before it gets better. • "The tech boom has created strong talent pools, local economies are booming and there's not enough housing to fill the demand." • "Seattle, Las Vegas and San Francisco are leading the way with annual double-digit home price gains [as of] March ... nationwide, prices rose 6.5%. • "Seattle has now seen nearly six years of positive annual price gains, with 27 consecutive months of double-digit gains." The Big Picture: Housing costs in America's tech capitals are reaching absurd highs and will force tech companies to move beyond Seattle and Silicon Valley in order to attract and retain talent. • Lawrence Yun, chief economist at the National Association of Realtors: "In places like San Jose and San Francisco, even a starter home can cost more than $1 million. I am not sure they can attract high talent over time. You may begin to see the copy cat effect of other cities trying to replicate high tech sector areas." States of Play Not Gonna Happen Dept. Venture capitalist Tim Draper's proposal to split California into three states will appear on November's ballot, California's Secretary of State says. • Draper's proposal would see the creation of Northern California, including San Francisco and Sacramento; California, including Los Angeles and the Central Coast; and Southern California, including San Diego. But it's not going to happen, because roughly three-quarters of Californians oppose it. What next: The World Cup. Fox's coverage of the opening ceremony starts at 7:30 a.m. PT tomorrow morning, with the opening match of Russia vs. Saudi Arabia kicking off at 8 a.m.